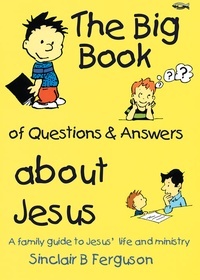 It is exciting to hear a child ask, “Who is Jesus?” Dr. Sinclair Ferguson’s The Big Book of Questions & Answers about Jesus is designed to help answer children’s questions that they have about the life and ministry of our Savior. Containing activities, prayers, and Bible references, this book is geared to teach children who Jesus is and what He accomplished. Sinclair Ferguson, frequent speaker at Ligonier conferences and former professor of systematic theology at Westminster Seminary in Philadelphia, has helped children understand the faith of the Bible. He does so again in this book.